A remarkable goal by Billy Clifford earned Reds their fourth win of the season. Clifford scored direct from a corner-kick, beating Kevin Ellison at the far post to give Reds a 17th minute lead. The Shrimps’ player Kevin Ellison was sent-off in the first half, leaving the hard task of trying to get back on to level terms for more than half the game with only ten men. Harry Kewell made two changes to the side which lost Carlisle last Saturday with Clifford making his first league appearance of the season and Moussa Sanoh making his first league start for the club. Crawley were forced into an early substitution when Lewis Young got injured and was replaced in only the ninth minute by Joe McNerney, making his first league appearance of the season as Josh Lelan moved to full-back. 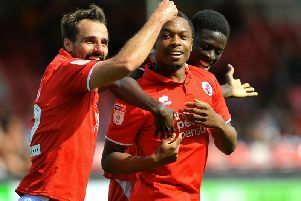 Reds went close to taking the lead when Jimmy Smith headed Lelan’s cross over the bar. Buoyed by a loud contingent of 63 away fans who had made the long trip to Lancashire, Town nearly found the back of the net again through Enzio Boldewijn but his attempt went narrowly over. Ellison was then sent-off for an off the ball incident picked up by the assistant referee leaving the Seasiders to see-out more than half the match with just ten men. Boldewijn and Mark Connolly also had decent first half chances. In the second half Sanoh showed flashes of skill but went wide and Smith collided with McNerney as he tried to head home a cross by Smith. Glenn Morris twice denied Morecambe’s Aaron Wildig from equalising with important saves, then he intercepted a cross by Aaron McGowan. The Shrimps pressed hard in search of a draw in the final stages but Crawley held on to earn a valuable away victory.